There are already over 300 members benefitting from our non-profit services, including discounts at local marine vendors, yacht insurance and health insurance. The health insurance program is underwritten by IMG and managed by the insurance experts at Gowrie Group with a choice of two deductibles with worldwide coverage at very low premiums for crews only with crew memberships. All memberships contribute to VIPCA's projects and initiates and members will receive quarterly newsletters about what's new in the VI Marine Charter Industry. 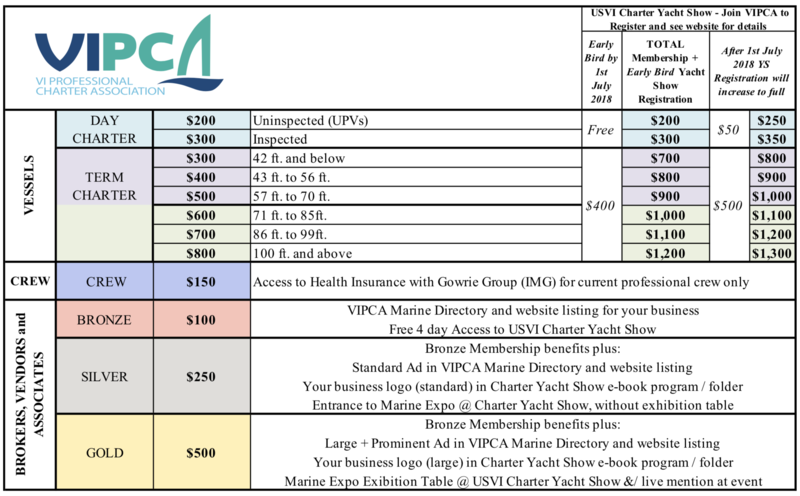 VIPCA provides advertising opportunities to the VI marine industry professionals and its charterers, as well as free access to the USVI Charter Yacht Show, and the Marine Expo with vendor exhibit. Berthing at American Yacht Harbour, Yacht Haven Grande, Crown Bay Marina and Puerto Del Rey. JOIN VIPCA as a BROKER / ASSOCIATE / VENDOR MEMBER to advertise your business, while supporting our programs. Yacht Show Marine Expo for vendors exhibiting. Register early to receive an "early bird” VIPCA vessel / vendor members discount.